Mirka Abranet allows you to supercharge the dust collection of your sander! The enhanced, multi-hole pattern of Mirka Abranet backup pads and accessories allows increased airflow for more efficient dust collection. Dust is drawn through the Abranet sanding mesh and through the enhanced hole patttern in the backup pad and matching accessories. Improved collection results in better surfaces and longer sanding disc life. The best dust collecting performance of this system is achieved when 5, 6 or 8 hole OEM backup pads are replaced with the specialized multi-hole backup pad by Mirka. Because the dust collection abilities of many sanders are limited by their ability to generate sufficient airflow, further improvement is gained when the sander is attached to a shop vac or central dust collection system. 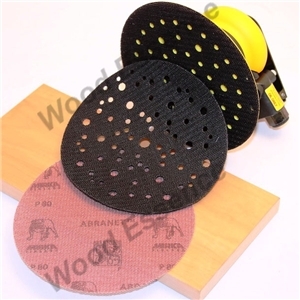 Abranet conversion backup pads and accessories are available for many popular sander brands. Mirka Abranet 2-3/4" Wide x 10 Yard Long H&L Mesh Rolls. Range 80 to 400 grit. Mirka Abranet 5" H&L Mesh Discs. Range 80 to 1000 grit. Mirka Abranet 6" H&L Mesh Discs. Range 80 to 1000 grit. Convert your Existing Sander to Abranet for Superior Dust Collection! Mirka Abranet HD Mesh Discs for Aggressive Sanding, Stripping and Shaping. Range 40 to 80 grit. Revolutionary Mirka CEROS Sanders. Compact Electric Random Orbital Sander. Abranet Pad protectors help prevent premature wear of Sander Backup Pads.